Hi friends! I hope you are having a great weekend! We are having a hard time right now. Both the kids are throwing up. I have no idea where we caught this. I'm hoping that it's just food poisoning but we'll see. Here's a card I made a while ago. It was based on an SCS CAS sketch. I used some Papertrey Ink stamps. 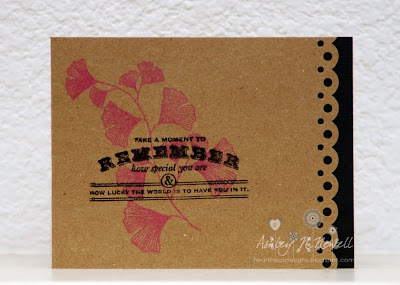 I used some Stampin Up Pixie Pink ink and some Memento Tuxedo Black. Just really clean and simple and very mailable. such a pretty card Ashley...love all that kraft goodness. My DD was that way last week...she missed 4 days of school! I love this card, these colors are some of my favorite and I love the flower. This has got to be one of my FAV FAV FAV cards ever! LOVE the colors and the simple design--LOVE that black strip on the side!! FABx10!! !